The Most overused and least understood concept in the stock market is Risk. Every other person has different explanation and method of calculating the risk. The calculation of risk is a very tricky thing in the stock market. You can be mathematically right but still not profitable in the stock market. I have heard so many people asking they are following the risk to reward ratio strictly and still they are not making money in the stock market. If you search Investopedia or even the Balance for risk to reward ratio you might come to know the stop-loss you are placing on the potential profit is the risk in the stock market. Now, this is a just half-baked dish you can keep having and keep complaining. The matter of the fact here to understand how to calculate the right risk for each stock. It is very important to understand that different things have different risks. When you take sports as an example the same risk cannot be attributed to Sky Diving and Cricket. Likewise, every stock is different in nature and the way it reacts to the stock market hence each of those stocks should be treated differently. The concept of Risk is enough for me to write an entire book. Will try my level best to keep it extremely short and to the point so that you don’t get bored and can immediately put to use the method of calculating the risk and managing the reward. 1.2 What is a Risk Reward Model? 1.3 What is the Relationship between Risks and Returns? 1.4 What is the Trade-Off between Risk and Return? Stock trading is the first step most people take while entering the stock market for the first time. This is the time when they realize how risky the stock market is mainly due to their own behavior. Likewise, stock trading is similar to surfing. Or any other high-risk sport. Even if you take horse riding there is a trade-off between the fast horse and how the jockey is able to manage the same. Both are equally important because if the horse is not of race category then there is no risk and the horse won’t run fast as well. An ace jockey can easily manage the fastest horse with right skills and knowledge. In theory, if you happen to visit any website and look out for risk to reward ratio you would find a very simple calculation which is reward divided by the total risk taken. In practical, especially in trading these values are highly dynamic and is difficult to calculate them. Moreover, there is no set formula for calculating the Risk. Hence, different people with different trading strategies will have their point of risk at different levels. This is where the first time traders get wrong totally and in spite of following a very strict stop loss and profit mechanism they lead to continuous losses. For example, if you trading BankNifty with a stop-loss of Rs. 2000 then you are ought to hit the stop loss quite often since bank nifty has higher movements when compared to other indexes. The solution to this is to understand Standard Deviation and use it wisely in placing the stop loss. What is a Risk Reward Model? The simple process to increase the stake in the trading success and outcome-based calculation model is risk to reward model. For beginners traders, it is essential to do Paper Trading to enhance the probability of winning by reducing the risk and increasing the win rate. What is the Relationship between Risks and Returns? The risk is directly proportionate to the reward one gets but vice versa may or may not be true. If you are a trader who is consistently earning high profits from the stock market then it goes without saying that you are taking high risks in the stock market. For every rupee one takes the risk in the stock market the trader should expect to return much higher than the risk he takes. 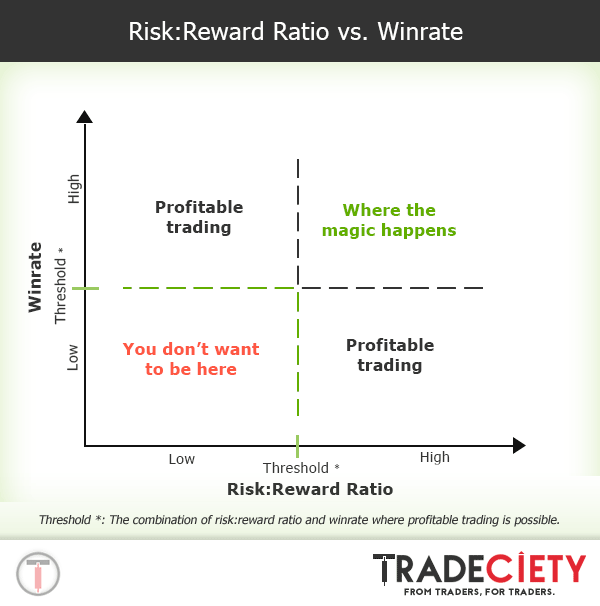 Hence most traders follow the fundamental risk to reward ratio of 1: 2 or 1 : 3 or higher. It is futile to expect a higher return without taking higher risks. But higher risks do not guarantee higher returns. In detail, you can read the Elements of Winning Trading Plan for understanding the risk and reward model better and to make money in the stock market. What is the Trade-Off between Risk and Return? The stock market reward people taking the right risk in the stock market. For those who are looking for a guaranteed return in the stock market should usually invest in low-risk investments like government bonds etc. For medium risk, one should invest in ETF, Gold, Mutual Funds or debt Funds. For the high return in the stock market trading in the stock market or derivatives gives the highest return also has the highest risk. It is important for you to first discuss and understand your financial situations from a financial advisor to understand your ability and willingness to tolerate risk. Finding the right balance between risk and reward is fundamental to investing. There are many ways to calculate the risk to reward ratio. The one that suits you the most is the one which is most profitable. Every method and system cannot be profitable for everyone. Some use Options Trading Strategies to mitigate the risk while others use Technical Analysis. It is your choice which suits you the best while choosing the right combination of risk to reward ratio. At times even if you are not investing in the stock market can be considered as the risk. Another school of thought also has a valid point of mitigating the risk by opening a zero brokerage account.